NOTE: The Spences Bridge Improvement District is seeking a Part-time Administrative Officer. Click here for more information. Postings are listed in chronological order, newest at top. 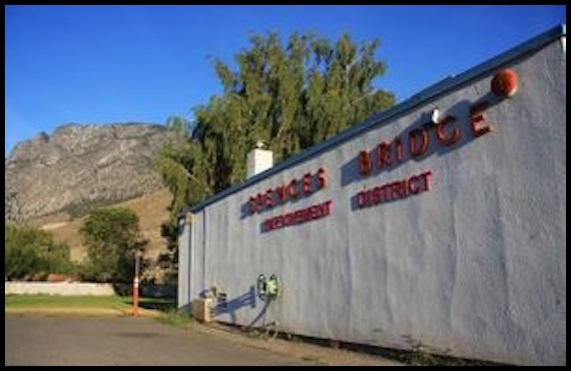 Posted October 28, 2017: Special Report: Spences Bridge Improvement District Sustainability Assessment Delivered at October 27, 2017 Trustee Meeting. 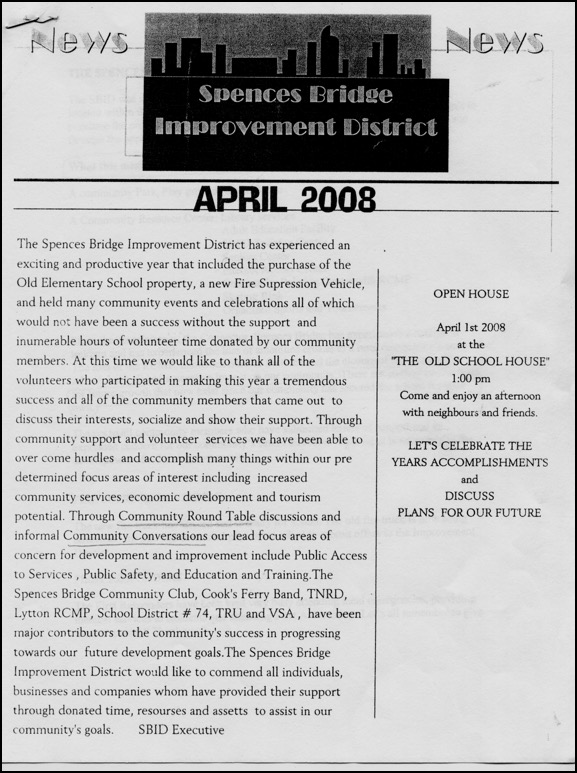 Letter sent by the Provincial Government Inspector of Municipalities to the sole remaining Trustee, Tina Draney, with regard to the Spences Bridge Improvement District’s future. Posted June 23, 2015. SBID NOTICE. Posted May 27, 2015. New section titled SBID MINUTES added here. Will be updated. HISTORICAL DOCUMENT: Notes on meeting held at Cook’s Ferry Indian Band Office on April 4, 2006 re SB Water System. Read PDF version of the document here. On July 21, 2014, Dwayne Rourke submitted the following list of questions to SBID TRUSTEES. He requested a written response. That response was forthcoming on July 29, 2014 from chairman Al Dickinson. A complete record of the exchange of letters follows. Question 1: What is your justification for removal of Community Club computer equipment from the SBID building? Response: We do not need justification as our mandate is only with fire and street lights. Question 2: The keyboard for the public access computer in the group of computers indicated above was removed a week prior to complete removal of all community club computer equipment from the SBID building. Did you have anything to do with that? If so, why was the keyboard removed? Response: Yes, I had it removed in order to negate a problem with an individual. Question 3: What is the current status of the relationship between the SBID and the Community Club? Are activities like the painting group, weekly lunches, Desert Daze, Post Office still allowed? Response: SBID has no status with the SBCC. We have tried to help the Community but SBID's Letter Patent do not allow us to. Question 4: Regarding the original terms of agreement with respect to SBID purchase of the old school property from the School Board… is this document available for view? Response: Yes, you may see it when Trudy is at the office. I can assure you it is only a purchase contract and nothing more. 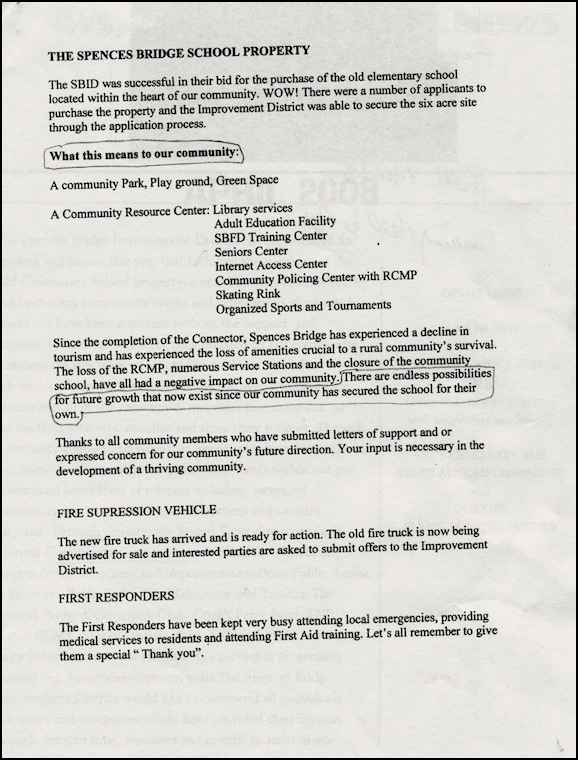 Question 5: What explanation do you have for the existence of the 2008 SBID newsletter proclaiming a bright future for the newly purchased schoolhouse property? 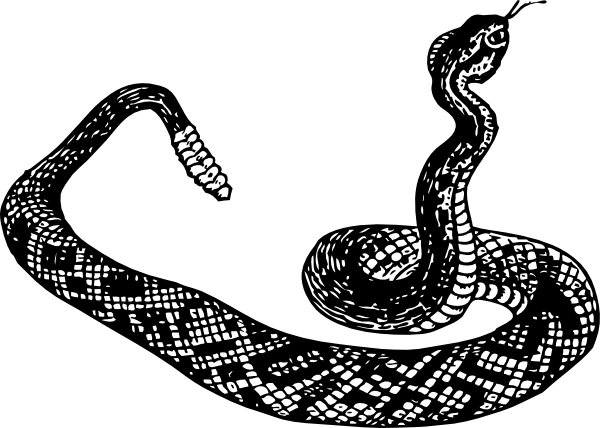 (see image below). Response: Do not need one. What we thought at the time has now changed. Question 6: Does the SBID have any kind of Internet presence? Website? Facebook? If not, why not? Response: No! After last experience with it we have decided not to pursue it. Question 7: Do you support our call for a repurposing of Old Spences Bridge to facilitate pedestrian use? Response: This has nothing to do with our Letters Patent. Question 8: A copy of the petition (signed by Paulet) to repurpose Old Spences Bridge was placed on the table in front of the SBID office on Friday, July 4. It has since disappeared. Do any of you know where it went? 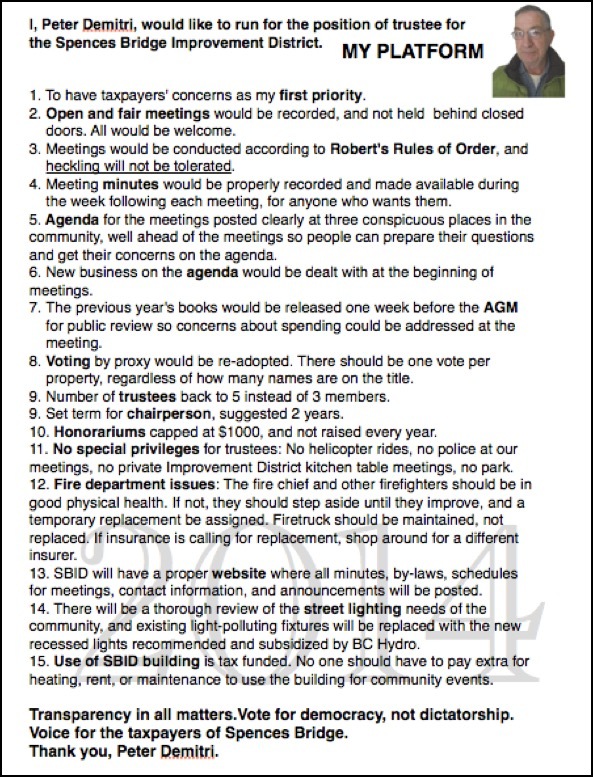 Question 9: Open public meetings of the SBID appear to have been discontinued. If so, why so? If not, where are they announced? Response: They became too confrontational as some folks would not respect our By-Laws and rules of order. All we are required to have open to the public is the AGM. Question 10: Are minutes of SBID meetings still available for public view? Where and when? Response: At the SBID office when Trudy is there. Question 11: What are the piles of gravel doing on the edge of the school yard? Where did they come from, and for what purpose? Response: Gravel is for SBID use and Fire Dept. Question 12: As a local government representatives, have you had any discussions with MOTI with regards to the demolition of Old Spences Bridge and possible mitigation measures? If so, what do you understand the MOTI mitigation measures to be? When will they be implemented? Question 13: What plans, if any, do you have in place regarding maintenance of the SBID building (exterior paint, roof repairs, etc)? Response: We are re-evaluating this issue. If the Park vote had passed all the issues (new roof, furnace, washrooms, etc.would have been eligible for grants. The SBID is not eligible for grants, these repairs and regular maintenance will be at the local tax payers expense and to do this SBID will have to raise taxes. Pete Dmitri’s election platform presented at 2014 AGM.